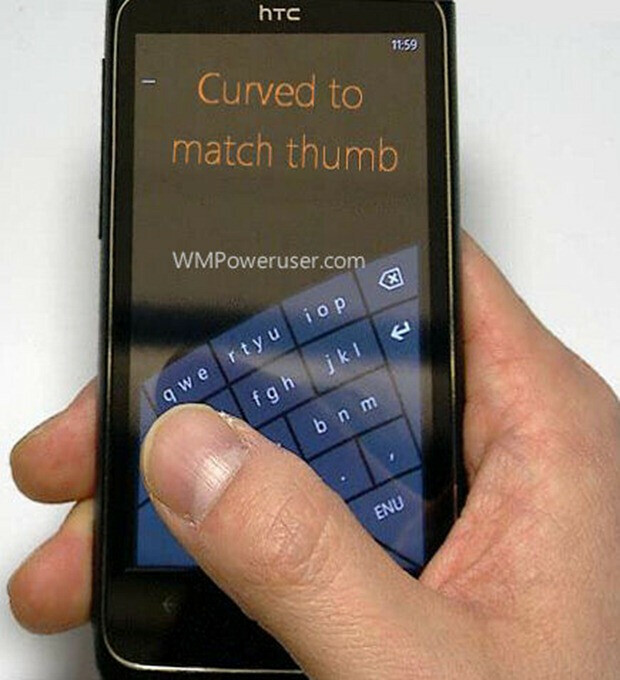 Now, here's a possible Windows Phone 8 feature that was not mentioned during the platform's announcement – a redesigned on-screen keyboard optimized for single-handed use. Too unlikely, you say? Well, not really. Back in June of 2011, we had a leak indicating that a "next gen soft keyboard" made for one handed input was being planned for Apollo. This photo, which was allegedly obtained from a leaked Microsoft Research presentation, shows what the said virtual keyboard might look like, if it happens to be real. But will an alternative keyboard like that be really necessary? After all, the current Windows Phone on-screen keyboard is already pretty comfortable to type on, even if you are not an experienced smartphone user, and even if you use a single thumb. Besides, judging by this leaked photo, inputting a given letter might require the user to tap a button several times, much like typing on a physical keypad, which doesn't seem like too convenient of a method to us. Yet who knows, if done right, this arching keyboard might actually work just fine once you get the hang of it. And if you don't need it, switching back to the old one should not be too hard. What do you, guys and girls, think? Do you think such a keyboard will be comfortable to use? Let us know by dropping a comment. typing with one hand? AWESOME!!! GIMME A BIG FAT SCREEN WITH LESS BEZEL PLEASE!!!! why the complexities? the current keypad is just fine. and anyway such a keyboard will require the phone to identify which hand the user is using to type-i dont type with a particular hand all the time..it depends. but if the phone somehow identifies if the right or the left or both hands are being used then such a feature might come in handy. Its ideal for one hand typing, of course it is more suitable for large phones or people with small hands that can't reach across the screen to type with one hand. As for left and right hands, I'm pretty sure it will come with a setting to switch between the two. what i mean to say is suppose i'm typing and suddenly i need to switch my phone over to the other hand. so i dont want to be meddling with crappy settings in the midst of the typing. and anyway how would the phone be able to guess which hand i'm using, if the manual settings are to be skipped? i dunno why the keyboard reminds me of 7210. Look great. But it would be nice to use the classic letter arrangement if they're going to design that kind of keypad.